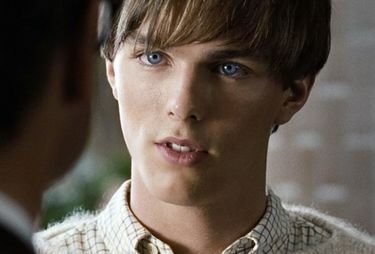 Nicholas Hoult of A Single Man : About a Boy Who's Become a Man -- With Oscar Prospects! 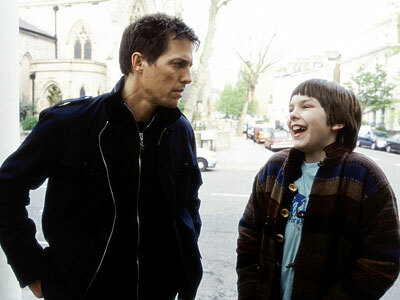 In 2002, Nicholas Hoult was a pudgy-faced awkward young boy who sort of stalked ne'er-do-well Hugh Grant in the delightful and moving film, About A Boy. America hasn't seen much of him since his auspicious debut forging a significant bond with Grant's character, in the process symbiotically helping each other to lead richer and fulfilled lives. This year he's back, and what a metamorphosis in seven years from the much teased, put-upon kid, who's been transformed into a twenty-year-old 6'4" hunk with a handsome face and striking blue eyes. The latter put to good use as he returns to similar territory, obsessing about an older man. In this case, he's stalking his college professor Colin Firth in the lovely film, A Single Man. It's not as if Nicholas has been idle in between; he was on a popular British TV Series, Skins and in some less popular U.S. features. Which explains why for most of us in America it's startling, not only to see the physical change to manhood, but to remark how intriguing and comparable the roles are in About A Boy and A Single Man . Almost as if it's the same character grown up, still in need to bond with a man much older than he. There the resemblance ends, though, as A Single Man is much darker and deals with current societal issues such as gay marriage, but, set in 1962, the environment is even less forgiving. Making matters worse, Colin Firth, as George, has to cope with the recent death of the man he's been living with over 16 years. We mostly follow Firth's life, seeing him at the university and experiencing flashbacks with lover Jim, played by Matthew Goode, as Firth prepares a meticulous end to his life. All this is intertwined with Nicholas Hoult's character Kenny, who mysteriously and quite brazenly probes his professor to an almost uncomfortable degree, utilizing steel-blue eyes almost like lasers to lure George to a liaison. The middle of the film shows more preparation for George's planned demise, including some overlong expository but sometimes wonderful moments with best friend Charlie, played by Julianne Moore. But after a half hour or so we are wondering what happened to Kenny, and, like a good set of bookends director Tom Ford has placed, Hoult appears at a local beachfront bar, where George has gone for a final drink. Without so much as a hesitation, Kenny is welcomed by George and the two, on a dare by Kenny, go skinny-dipping in the Pacific during the wee hours of the morning. Then, like a beautifully choreographed ballet, Kenny and George go back to his place, where the younger man lovingly tends to a nasty cut on George's forehead. It's a curious and seductive foreplay amidst Kenny's pointed conversation, co-written by Ford and David Scearce, based upon the novel by Christopher Isherwood, and punctuated by, you guessed it, Hoult's incredibly focused blue eyes. What follows follows, and you'll have to see the film to see how it plays out. This piece is an homage to supporting actor Nicholas Hoult, who as an adult is definitely now a comer, bandied about on Twitter, Facebook and YouTube, having tenderly engaged and matched veteran Firth with his performance. A mean accomplishment as both men are British actors, but Hoult's character is a California boy and he delivers a flawless American accent. If Firth is Oscar-nominated for Best Actor as is the Award Season buzz, then so should Nicholas Hoult be in the Academy finals for Best Supporting Actor. Hoult is a marvelous young talent with whom I would be anxious to work (yes, believe it or not I have a script), but in the meantime you heard it from me. Given the right roles he might well be his generation's Leonardo DiCaprio.